Some devices fail in the marketplace because they are simply crap (witness the early Pandigital tablets) or lack adequate support (witness Pandigital the company), while a select few devices are market failures because the general high quality is weighed down by a ridiculously high price. The Alex eReader from Spring Design falls into the latter category. This was one of the hot new gadgets when it was unveiled in 2009 and it was the highpoint of many a blogger's coverage of CES 2010 (I could not even get near it). It went on the US market in early 2010, sold a handful of units, and then left for more profitable markets (Russia). Okay, so this ereader is only a couple years dead, so it's a little early to dig it up out of the grave and dust off the corpse. But I have just gotten my hands on one after waiting for nearly a year for it to show up on Ebay. I wanted to gloat a little. The Alex has a 6" E-ink screen, a 3.5" LCD (320x480) screen, and runs Android 1.5 on a 600MHz Marvell PX30 CPU. In addition to Wifi, it also has a microSD card slot but lacks the g-sensor as well as much of everything else we've come to expect on current Android devices. 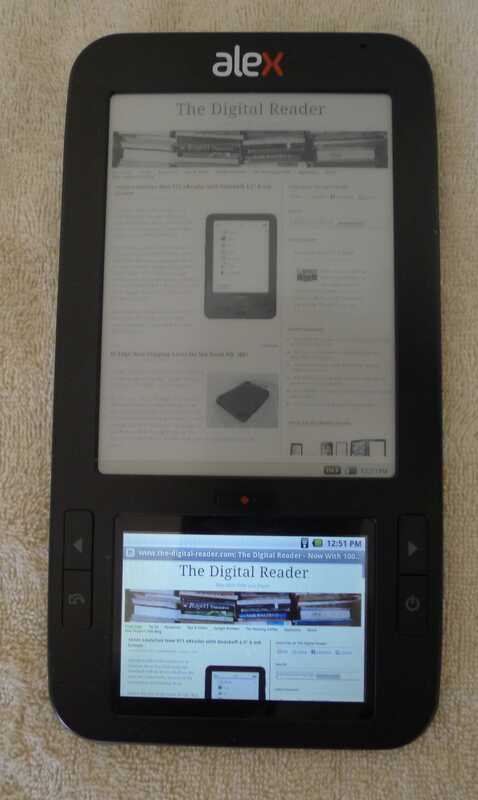 As you can see from the image at right, this ereader looks something like the original Nook, a detail which lead to much acrimony when the Nook was unveiled in 2009 as well as a lawsuit in 2010. But in practice it was much more capable than Barnes & Noble's second ereader. It was something of a cross between a dual screen tablet (like the Entourage Edge) and an ereader. The bottom screen behaved a lot like a custom PDA, while the upper screen was used both as a reading app as well as a repeater screen for the lower screen. Theoretically you could have used other reading apps on the upper screen, but I can't recall finding any apps which could do that - not in 2010, at least. But simply finding Android apps was enough of a pain that year that I could easily have missed the ones I needed. I had my hands on this ereader in 2010, before I returned it thanks to the $400 price tag. At the time I marveled at the ability to use the lower screen to navigate the web and the upper screen to read. The combination was novel at the time, but given the numerous decent 7" tablets I've seen on the 2 years since the novelty has worn off. And now that there are E-ink equipped ereaders like the Nook Touch and Sony Reader T1 there really isn't much of a point for this concept anymore. But as I sit here looking at it, I can see now that the Alex was such a quirky device not because the concept was a great idea (it was at best a compromise) but because it was one of those ereaders which were conceived and developed during the ereader bubble. What is the eReader Bubble, you ask? That's the name I have given to a period of time which stretched from mid-2008 and ending in mid-2010 where any number of crazy plans were laid for ereaders. This is when Samsung started planning to launch 4 ereaders, when the Entourage Edge was developed, and when PlasticLogic still thought that they could sell the $800 Que as a business market ereader. The bubble led Astak, a nobody consumer electronics company, to think they had the technical skill and business acumen to launch a line of ereaders. Needless to say, that went nowhere. The bubble might also explain poor decisions like Pocketbook's plans to merge their ereader division with Netronix, the Taiwan based ereader developer. This was another piece of news which went nowhere. And arguably the bubble put Pandigital and Augen on the road to ruin. These 2 companies got into ereaders in 2010 before switching over to tablets, but they never seemed to managed to keep their expenses below their income, a detail which comes as no surprise given how razor thin the price margins of the gadget market are. Heck, that period was such a bubble that even RCA was going to launch an ereader. The Lexi never hit the market but it did make a splash at CES 2010. This bubble was IMO inspired by the launch of the Kindle in 2007. Given the needed time to develop the hardware which showed up in late 2009, it seems likely that the early explosive success of the Kindle and the Kindle Store was the instigation for the eReader Bubble. And as anyone with a long memory can recall, the good times were over with by 2010. One could argue that the launch of the iPad ended the honeymoon, which could certainly have been the case for the large screen ereaders like the Que. But I think the bubble ended with the Nook-Kindle price war. That was in mid-2010, and after the price of the Kindle dropped to $139 there simply wasn't much of a margin for anyone else. Now, if that period was a bubble then the next question would be to ask what period are we in today. I'm not sure, but I can point out that we've already passed through an app bubble (for the iPad, at least) in 2010 and 2011. If I had to guess, I'd say we could arguably be in a self-publishing bubble at the moment. There's an awful lot of hype surrounding self-publishing, and even some major players like Penguin looking to cash in and gouge authors via Book Country and the recently acquired Author Solutions. There's also an awful lot of startups which are all trying to help authors get published, but I'm not sure those startups define the bubble. Most are small and self-supporting. Wait until someone starts throwing around 100-million-dollar IPOs and then we might have another bubble. We live in interesting times, do we not? SNORT! Can’t even run the Kobo app, which required 1.6, as did most eBook apps from that time. I forgot about the Cool-ER. Oy. Now there was a sign of a bubble. Why don’t you write posts like that anymore? Because I am now post-eBook. Let the fuckers catch up with me first. No longer wasting my breath. As always Nate, it is great to hear your perspective on the evolution of digital reading. I love “vintage” eReaders as well. eBay is a great place to snag that device you always wanted to check out, but didn’t have the $400 required when it was new. You post has reminded me of the 9.7″ iRex DR-800, and how Amazon used to justify the insane price for the Kindle 1 by talking up its ‘advanced’ wireless antenna. Recently, I found a new, in-box eBookwise 1150 on eBay. I just got the package yesterday. Unfortunately, I can’t figure out a way to get eBooks on the damned thing now that eBookwise & Co. are moribund. The websites, manuals, and drivers are still posted, but I’m basically sifting through ruins. There is no way to create a new online bookshelf account. If I can find a Smart Media Card reader, maybe I will have a chance. Calibre converts eBooks to .RB format, so we will see. For now, I am entertained by reading The Time Machine on it, an eBook that came pre-installed. If you have any thoughts on this matter, let me know. Irex is one of those companies that lacked the hardware competence and software competence needed to develop an ereader as well as the business acumen to identify their lack. That device is on my buy list. I doubt you could find a NIB EBW-1150 on Ebay; technically they were all refurbished REB-1150. But it was one of those odd devices which did okay right up until the launch of the Kindle. As for getting it working, let me connect you with the one guy I know who was an expert. Always interesting to see something about Alex, as I still use mine and don’t own a Kindle or a Nook. The wife adores the 2nd screen and doesn’t even want those fancy backlit ones. Bubble? I’m thinking we’re in a Tablet Bubble. I see the collapse as imminent, with the first prominent canaries going belly up. Given that several makers of crappy ereaders quickly moved to tablets, you could be correct. But I’m not sure the Tablet Bubble is over; cheap tablets are still being launched by the dozen. But the bursting of the bubble is in sight. 12-18 months. Probably less. If the rumored $99 Nexus becomes reality, it’ll very likely be a lot less. The thing about a bubble is that it is defined by crazy decisions. The Dutch Tulip Craze, the Real Estate Bubble, and the Tech Bubble all had people making poor decisions based on hyped conditions. I’m not sure we’re seeing that with the tablet bubble, and that suggests there might not be a tablet bubble. But then again we are seeing constant price drops as well as many new launches (of marginal quality devices into a tepid market). Those could be the poor decisions. I suspect that Microsoft’s obsession with Win8 tablets and touchscreen interactivity could be a sign of the bubble, assuming they come to naught. Given how MS decided to center their latest OS around the touch-friendly Metro interface, even though it’s going to be installed on quite a few laptop and desktop PCs, it certainly seems crazy. But MS has had past obsessions with hardware concepts which didn’t work out (UMPC, all-in-one PCs, etc) so the Win8 tablets might be unrelated. Edit: On second thought, I think I’ve lined up enough evidence to prove we’re in a tablet bubble. Interesting. I’m in the Bernanke camp: you have a bubble when people are letting their irrational exuberance lead them to do things they may not live to regret. Or, as they said the PC clone era: 500 companies each hoping for 5% market share. Try this: Toshiba, Sony, Sharp, Acer, Asus, Lenovo are all designing and selling android tablets. So are Polaroid, Coby, and a zillion no-name vendors. And what are people buying? Apple, Kindle, Nexus, Apple, and Samsung. Next on my soon-dead list is Coby, and then Velocity Micro, Ematic, Skytex, and Southern Telecom (they re-brand Polaroid and Uniden tablets). And there could even be more. Any idea what the next tech-toy bubble will be? B&N launched the Nook and Indigo launched Shortcovers/Kobo as a result of the success of the Kindle. Did they have to launch the ebook subs in order to compete or did these 2 retailers get swept up in the bubble? I suspect Indigo got caught up in the bubble; they dominated the Canadian market and thanks to Canada’s protectionist economic policy Indigo was assured of maintain their dominance. Arguably there was no need to make huge capital investments in developing the hardware just to enter the ebook market. B&N, well, that’s another matter. Well, Indigo flipped Kobo to somebody with deeper pockets and suffering from Amazon-envy so they got over ebook fever pretty quick. They made a tidy profit, too. Indigo also had the good sense to get capital investors and foreign retail partners involved before they got in over their heads. All the partners have since gone bankrupt, but that was a good idea at the time. You know, I’ve read a few reports that the lady running Indigo is a major league shark and that summary of yours tends to validate it: All the partners went under but Indigo still sold Kobo at a big profit. And they did it just as the biggest market of all plateau-ed. Talk about knowing when to fold’em!